projecting Britain and the British character"
Watching the three films from the Ealing Classics Collection, you could be forgiven for wondering if that motto is accurate. The studio was founded by Basil Dean in 1931 under the name Associated Talking Pictures, but it was following the takeover of Michael Balcon in 1938 that the studio adopted the Ealing name. It was under Balcon's tenure that the films also began to develop the characteristics that would come to be associated with the studio; typically championing the small communities' struggle against the forces of governmental and corporate bureaucracy (or the forces of the Reich, as period dictates). Ealing's Britain is traditionally seen a world of shopkeepers, pub landlords, bobbies on the beat and gossiping fishwives; its villains a collection of bowler-hatted civil servants and unscrupulous industrialists. So the phrase 'Ealing Comedy' is now part and parcel of any film history of Britain, but the studio's output crossed many other genres; The Blue Lamp is a procedural crime-thriller, Dead of Night a gothic portmanteau ghost film, It Always Rains on Sunday a moody social-realist drama. Considering this, it is perhaps unsurprising then that the films here move into different generic territory; however the character of the three films on offer is quite un-British. Less 'Ealing Classics' than 'Ealing Abroad'. First up is The Overlanders, a project that was started during the last years of the Second World War and is a mix of wartime melodrama and frontier western, reminiscent of the Baz Luhrman's recent Australia. The film's concern is the scorched earth policy adopted by the Australian authorities in the country's northern territory – destroying supplies and equipment rather than letting the Japanese get their hands on them should they mount a successful invasion. Rather than let 100,000 cattle be slaughtered, drover Dan McAlpine elects to drive them 2000 miles to Queensland instead. To achieve this he recruits a band of drovers including a British sailor, a pair of Aborigines and a farming family. The film then follows a course of pretty standard perils including crossing a crocodile-infested river, negotiating a steep mountainside, and the obligatory stampede. As we'll see with the other films in this release, there is a preoccupation with background details in The Overlanders. Narration is handled by protagonist Dan, who dutifully fills us in on the techniques, procedures and dangers associated with cattle droving. This use alternates between providing background colour and as the basis for dramatic action. For example, in one scene the cattle are dehydrated and being rested next to a river that is too dangerous for them to drink from. Dan tells us the smell of water is enough to drive the cattle mad in their dehydrated state, and should the wind turn they'll stampede into the river and all will be lost. So, a scene which is essentially cows lying down whilst nervous drovers stare at the fluttering breeze is injected with real tension. 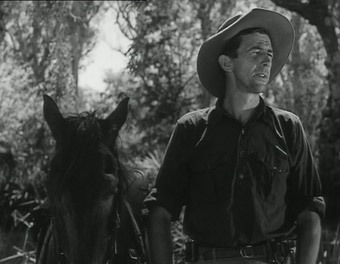 By contrast, a scene in which wild horses are trapped used is preceded by a rambling commentary by Dan in which the precise techniques for horse trapping are laid out in banal detail, effectively killing the tension of the scene before it has even begun. The Overlanders wears its propaganda on its sleeve. It opens with a close-up of a government poster depicting a caricatured Japanese soldier standing leerily over a map of Australia, followed by shots of the Parsons family burning down their home whilst the father, Bill, proclaims 'the japs'll get nothing from me.' Ealing liked to use small groups of people to stand in for the experiences of the whole nation, their villages and communities were cross-sections of society. Character development is ditched in favour of broad strokes to be as representative as possible – we don't even find out the British sailor's real name, and the characters aren't fleshed out beyond their functional roles. 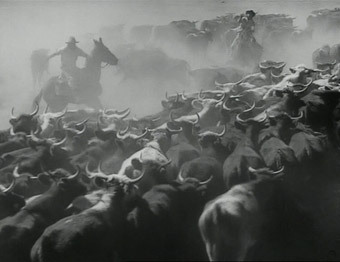 The crew find themselves inspiring similar cattle drives all across Australia, the last sequence a montage of rugged-looking men and women herding cows across the plains in defiance of the Japanese. Although the characters are somewhat shallow in their construction, there is a neat touch in Daphne Campbell as Mary Parsons who is clearly the most competent of all the drovers. It is unusual to find strong female characters in westerns, but Mary is brave, assured and talented – she saves Sinbad's life at one point and is given a lot to do for much of the second and third acts, in a refreshingly prominent female role. There are also some finer strands woven into the unsubtlety; when Sinbad asks what the Aborigines are singing about, Mary replies 'About the time his people owned this land – when they were happy.' Another more reflective moment occurs when Dan discovers Corky's plan to exploit the northern territories after the war; Dan muses that Australia should be left for 'real Australians', not the desires of big business. Its an unusual, though admirable sentiment for a film of this type. Ultimately The Overlanders hasn't aged well, and though that shouldn't really be held against it, the amount of attention paid to the business of cattle droving, and the impenetrability of the propaganda render it a difficult viewing experience. Next we have a film that strikes an early blow for animal preservation against the most thoroughly detestable form of screen villainy, the ivory hunter. 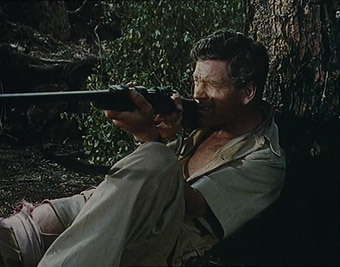 Anthony Steel stars as Bob Payton, a game warden living in Africa who sets up a nature reserve for the purpose of keeping hunters and poachers out. This effort brings him directly into conflict with the local tribes and the dastardly ivory hunter Mannering (Harold Wanderrer). The films pre-titles tell us that the film is based upon the life of Mervyn Cowie, a noted conservationist who was responsible for the real-life struggle to found a reserve in Kenya. Like The Overlanders, there is a documentary undercurrent to Where No Vultures Fly that repeatedly threatens to drag the viewer under. The film structures a lot of the action around Paul Beeson's wildlife photography; so, a scene is worked in to showcase footage of a rhino attacking a camera, and a sequence in which Payton traps a wild leopard is structured around the documentary footage of the leopard itself. This isn't as distracting as the narration in The Overlanders, being worked into the narrative in a more organic fashion, although visually the footage itself is often jarringly out of sync with the conventional scenes. These shots are most strikingly deployed in the end chase sequence, as Mannering attempts to flee in a jeep whilst being pursued not only by our heroes but also by the documentary footage itself. The film understandably over-indulges in the game photography, and it is remarkably candid, but the enthusiasm for the footage often results in long periods of narrative standstill. 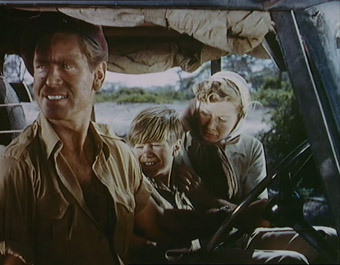 One early sequence shows Anthony Steel taking his boring family on a tour of the reserve, dishing out facts about the animals in voiceover; although informative, it leaves the main plot feeling a little perfunctory. Which is not to say there is a great deal going on in the main. Far too much time is spent at Payton's tedious domestic dwelling, and despite Dinah Sherriden's best efforts at making her character more than window dressing, she is largely marginalized. Also slightly dubious is the representation of the native population – either as willing workhorses (cringe as they are constantly referred to as 'boys') or double-crossing tribesmen. In a scene where Payton is trying to drum up support for the game reserve idea, there is a montage of takes showing him being rejected by various local parties. Tellingly, in the middle of these petty bureaucracies is a bespectacled African official who states 'The interests of the Africans are paramount'; the demands of the native populace are the equivalent of the concerns of the local tourist board. Anthony Steel as Payton provides a suitable Boys Own atmosphere, though his character is quite useless. In the final showdown between Payton and the villain Mannering, Payton is instantly felled by a spear to the leg. He plays the rest of the scene lying down, shouting at Mannering to 'get out of Africa' whilst Mannering dresses the wound for him. Its a ludicrous climax made even more bizarre by a subsequent leopard attack in which Payton runs out of ammunition and is saved by yet another of the villains. Unfortunately, besides from the often stunning wildlife shots (even as part of the generation spoiled by Attenborough, they're wonderful to watch) there is little to recommend about Where No Vultures Fly; its probably only worth a look to Ealing completists. The last disc in the collection is the most enjoyable and closest to the traditional image of the Ealing film. Filmed at Heathrow, with full co-operation with the Ministry of Transport, Out of the Clouds follows the lives of the staff and passengers that come through the airport over 24 hours. Like the other films in the collection there is an underlying documentary and marketing project at work, making the world of commercial air travel as attractive as possible. Rather than a single over-arching story, Out of the Clouds is composed of several smaller stories woven together. Anthony Steel plays Gus, a pilot with a gambling addiction who supplements his income by indulging in some smuggling. 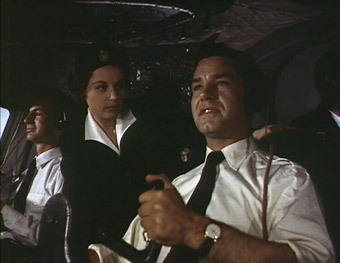 Robert Beatty is Nick, the chief officer who yearns to get back into the sky who is involved in a love triangle with Gus and a stewardess, Penny, played by Eunice Gayson. Visiting the airport are American Bill and German Leah (David and Margo Lorenz), who find themselves crossing paths on opposite journeys and falling in love. The presence of multiple storylines helps to diffuse some of the PR, which is quite entrenched within the film. The lives of the pilots and cabin crew is portrayed as glamorous and cosmopolitan – the crew arrange dates together in Cairo, and attend parties in luxurious hotels. Likewise the advertising concerns of the film extend to some of the characterization, with great pains being taken to show the airport staff as relentlessly helpful and constantly going beyond the call of duty to help customers. Likewise there is a fascination with the day-to-day business of flying, immigration procedures, what happens when planes turn back, who needs to get landing visas etc – that would doubtlessly be of interest to an audience unfamiliar with commercial air travel. Perhaps these audience concerns feed in to some of the wider representations in the film, for there seems to be a conscious effort to reconfigure the airport in more familiar generic terms. The airport functions are represented using the same codes and characterization as seen in the naval war film. There is a spatial and class split between the tower staff and the runway mechanics, like the split between the engine room and bridge. The planes are referred to like women, and spoken about in the same way submarine captains speak about their boats (one pilot says 'she still rises' and refers to his plane as a 'temperamental cow'.) Like the naval film, fog is a constant danger to be avoided like anthrax – a scene in which a pilot is forced to make an emergency landing is reminiscent of an 'incoming torpedo' scene in a submarine film, all close-ups of radar, sweating faces, instrument dials and dialogue comprised of lots of echoed commands. Its an interesting process and one which gives an insight into how fledgling commercial airlines were seen. Entwined in all of this is a more philosophical sub-plot concerning the two airline passengers who fall in love. Its the internationalism of the airport that allows these two people to meet whilst their planes are grounded by fog. Although its a little ham-fisted that the girl, Leah, is a holocaust survivor and that the man, Bill, is making his way to Israel to find his fortune, the story is a neat one that delivers its message effectively. However, even this sub-plot is marred by PR; at one point they are taken on a tour of the London by a cheery cockney cab driver, and are reliably informed by a pub landlady that the East End now resembles 'the ideal home exhibition'. You can forgive this due to the very tender way the couple's scenes are played, and although Bill is a little too eager for Leah (he falls for her after a 2 minute conversation in an airport cafe) there are some touching moments as they ponder the brevity of their affair. Out of the Clouds is certainly the most accomplished film on offer here, due in no small part to the presence of Basil Dearden behind the lens, who keeps things moving at a upbeat pace and with tight direction. Unlike The Overlanders, the PR doesn't completely drown the film out, and if you can see past it there is quite a lot to enjoy. The Overlanders is framed 1.30:1 and shot in black and white. It's a solid transfer from a good condition print, with the contrast, tone and detail all very pleasing. It's no Criterion restoration, but in terms of picture quality, it;s the best of the bunch here. The sound is Dolby 2.0 mono, quite loud and unsurprisingly limited on its dynamic range. There's a touch of background hiss and crackle, but this is not intrusive. Where No Vultures Fly is also 1.30:1 but in colour, colour that has faded a little and lost something of the punch it probably once had. The picture is quite sharp, but a little on the bright side in places, and though cleaned up the odd scratch still appears on a few of the location wide shots. The mono soundtrack is clean, but voices are a little clipped in places and there's a slight treble bias. Out of the Clouds is also 1.33:1 and also in colour, but here the colour has in places almost faded away – at times it looks more like subtly tinted monochrome. The contrast is also weak here, with black levels rendered largely as mid-greys. A clean print with reasonable detail, it fares a lot better in daylight than in darker scenes. The digital grain really pops in fog, which is where the contrast is at its weakest. The mono soundtrack is clear enough, but if you're redirecting bass through the subwoofer you might want to switch that off, as it tends to amplify an otherwise almost imperceptible background hum, though does give engine sounds an impressive kick. It's a slightly slapdash collection, this, with not much in the way of thematic or even aesthetic links. That said, Out of the Clouds is worth a look and the wildlife photography in Where No Vultures Fly is of interest, but overall the title 'Ealing Classics' is a touch misrepresentative.